Woodrow Wilson appears on the largest note ever produced by our government. The $100,000 bill wasn’t circulated among the general public, but instead was used for transactions between Federal Reserve Banks during the Great Depression. Money fascinates people of all ages. Its portraits, symbols, and words tell a story of our nation’s past. For many years, Lady Liberty was the most common icon on currency. Today, it is the presidents that dominate our money. 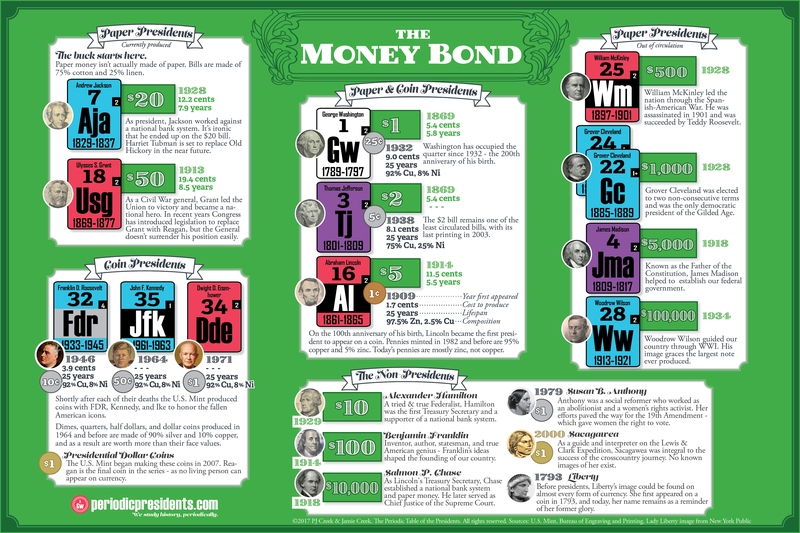 Check out our newly-updated blog post about the presidents and our money. The infographic and article tell a story of our country’s money – both past and present. We’ve included interesting facts such as the cost of production, composition and lifespans of currency, as well as short bios of the men and women on our currency. Want to share this with your students? This infographic can be easily printed or projected. And, here’s a lesson with questions (and answers) to give your students a more in-depth look at the history of our country’s money.